Instant knockdown formula kills the entire nest of wasps, hornets, yellow jackets on contact. Jet blast up to 22 feet lets you spray from a safe distance. Non-conductive up to 47,300 volts. 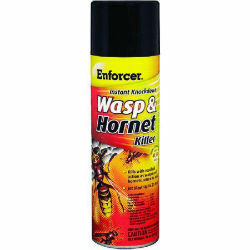 Residual action kills wasps and hornets returning to the nest. For Outdoor use only. For best results, spray in the early morning or late evening when insects are at rest.